Pine Creek Rail Trail March 20 Update For Bicyclists By David Ira Kagan It�s March 20, the first day of spring! Let the good news be heard! The wicked witch of winter is dead! The Pine Creek Rail Trail has finally shed its snow-and-ice coating and is open to bicycling and hiking for 2011�at least from Jersey Shore to Jersey Mills (a distance of about 16 miles)�based on this writer�s outings as of Sunday, March 20. 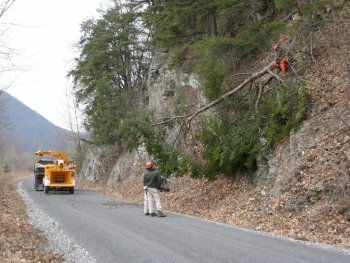 Department of Conservation and Natural Resources (DCNR) workers have been out clearing fallen trees, mending eroded sections, and placing orange cones by areas that they will get to soon. They are dedicated state employees, who should always be thanked when seen in passing by those using the trail. Already this year they cleared a major tree fall about two miles above the southern terminus at Jersey Shore. At that location, they also repaired what had been an almost impassable eroded stretch. And less than a half mile north of that, they chain-sawed down and towed away another tree trunk that was about to topple across the path. Their hard work continues daily now, filling in and smoothing out the numerous additional ruts and holes caused by water erosion. DCNR�s year-round maintenance of the beautiful 62-mile-long rail trail includes a variety of tasks: raking and rolling the surface later each spring, trimming back vegetation from the sides, spraying for weeds on the trail surface, repairing holes and ruts and removing fallen trees and branches (especially right after violent storms), cutting down overhanging tree limbs, replacing broken fence rails, keeping the comfort stations in good shape (last year they even cleaned out the dirt, bees� nests and other insects from the vent fans! ), and even, again last year, greasing all the gates along the trail. Once more, applause is in order for the DCNR workers who focus on maintaining and restoring the Pine Creek Rail Trail for all to enjoy. What they do is such a nice contrast to the destruction visited upon the land by the gas industry.